Suzy Miller is a single mother of three who created the first UK 'divorce fair' last March in Brighton, which was featured in Wogan's 'Thought For The Day' and received positive International Press coverage. Funnily enough – although I run an online directory of vetted professionals (www.certainshops.com), am creating the first UK resource site to signpost people through life changing experiences (about to be launched) and created the first UK divorce fairs – I have never written about the experience of combining single motherhood with business. 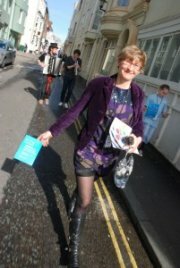 And I’ve written about a lot, as you will see from many blog entries within www.startingovershow.co.uk. My experience of being a single mum, who is also a businesswoman, has been that the excuse “I can’t do that, because I have kids” is much used by women with children, husbands, regular incomes – but being a single mother with 3 young children, I realised early on in my single motherhood, that I take enormous entrepreneurial risks, create meaningful businesses that may or may not make me self sufficient financially, and follow my vision, BECAUSE of my children. If ever there was a reason to follow your soul, be true to yourself, and lead by example safe in the knowledge that children don’t see ‘failure’ the same way our adult peers do – it has been as a single mother. In a secure safe family environment with another adult to fully rely on, I would never have discovered and explored my love of creating a new business, or risked everything more than once to create businesses that I believe in. If everything went pear-shaped, the kids are still happy as long as I’m happy. But I would not want to put my husband’s or partner’s financial future at risk because of my entrepreneurial disposition. To do so would seem very irresponsible to most people, and I can understand why – but creating businesses is a passion, not a logical, sensible pastime. Running them takes logical sensible people – but creating anything involves courage and focus. These qualities can come into being from going through emotionally challenging, frightening experiences – like finding yourself alone with three children, the house being sold underneath you, with no legal rights because you stupidly didn’t sign any legal contract (and common law marriage does not exist). The worst things that happen, can become the best things ever to have happened. My businesses and my children are both equally at the center of my lives. My youngest (8) often asks when I’m going to stop giving all my money to the business and get a ‘proper job’. I answer that I will review the situation at regular intervals. My children are realists and I listen to their wisdom, but they have learned and understand none the less that single mums do not treat business as a part time hobby – it’s too tough for that when your whole financial future is at stake, and you are alone. For us, business is an expression of who we are, who we aspire to be, and what we can create for others beyond the realm of our family life. To find out more and to buy tickets for the Starting Over Show go to: http://www.startingovershow.co.uk, or visit the SOS Village resource site at www.sos-village.org.